Former Washington Post reporter Bob Woodward speaks during an event sponsored by The Washington Post to commemorate the 40th anniversary of Watergate, June 11, 2012, at the Watergate office building in Washington. Excerpts from the new book about the Trump presidency, authored by the journalist credited with helping to drive President Richard Nixon from power, describes the current administration as suffering an “administrative coup d’etat” and a “nervous breakdown” during its first 19 months. “Fear: Trump in the White House,” a 448-page work by Bob Woodward set to be released September 11, describes aides stealing papers off the president’s desk and taking other actions to circumvent the intentions of the commander in chief. It paints Trump as dangerously ignorant of world affairs and his White House as dysfunctional and devastatingly beset by internal feuds. 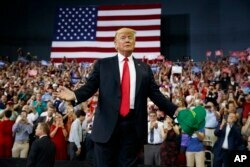 President Donald Trump arrives to speak to a campaign rally at the Ford Center, Aug. 30, 2018, in Evansville, Ind. Although there have been previous revelations by journalists and former White House staffers of upheaval in the White House West Wing since last January’s inauguration, Woodward’s account paints a more disturbing portrait of this administration. Trump, in a Tuesday evening tweet, also questioned whether Woodward is an operative of the opposition Democratic Party. Excerpts are contained in stories Tuesday from CNN and The Washington Post. 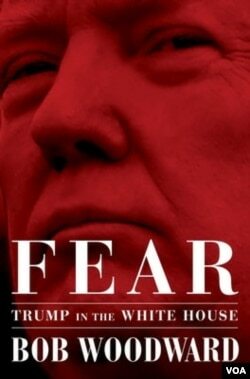 The cover of the book, "Fear," from publisher Simon & Schuster, by author Bob Woodward, about the White House under President Donald Trump. Kelly, in a statement hours after the media reports about the book, pushed back. Kelly statement emphasizes he is committed to Trump’s presidency, his agenda and the country. 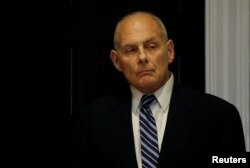 “This is another pathetic attempt to smear people close to President Trump and distract from the administration’s many successes,” Kelly said. 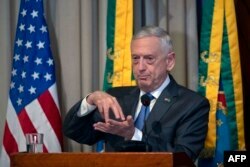 U.S. Defense Secretary Jim Mattis speaks during his visit at the Brazilian War College in Urca neighborhood, Rio de Janeiro, Brazil on Aug. 14, 2018. “The contemptuous words about the president attributed to me in Woodward’s book were never uttered by me or in my presence. While I generally enjoy reading fiction, this is a uniquely Washington brand of literature, and his anonymous sources do not lend credibility,” Mattis responded in a statement released Tuesday evening by the Pentagon. U.S. Ambassador to the United Nations Nikki Haley speaks during a Security Council meeting at United Nations headquarters, Aug. 28, 2018. “I have not once ever heard the president talking about assassinating Assad,” U.S. 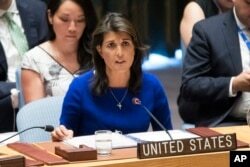 Ambassador to the United Nations Nikki Haley responded when asked at a U.N. news conference about that assertion in the book. ​The president’s former lead personal attorney, John Dowd, is quoted in graphic language referring to Trump as a “liar” who will end up wearing an “orange jump suit” if he gives testimony to special counsel Robert Muller, who is looking into ties between the 2016 Trump election campaign and Russia. Woodward repeatedly requested an interview with Trump for the book but did not succeed. The book also includes excerpts of discussions between the president’s lawyer and Mueller. The special counsel is quoted saying “I need the president’s testimony,” to determine Trump’s intent in firing James Comey as director of the FBI. “I want to see if there was corrupt intent,” Mueller is quoted as stating. ​The president recently escalated his feud with his own attorney general, Jeff Sessions, who has recused himself from oversight of the Mueller investigation, a move that angered Trump. “This guy is mentally retarded,” Trump is quoted in the book, saying of Sessions. “He’s this dumb Southerner,” Trump tells Porter, mocking Sessions by feigning a Southern U.S. accent. In another tweet late Tuesday against the book, Trump denied making those statements.